A boned and rolled pork shoulder is easier to carve, though if cooking for a long time over a low heat I prefer to leave the bone in for more flavour. Rub a generous amount of sea salt into scored skin and roast in a hot oven to get nice crisp crackling. 2. In a mortar and pestle, crush together the chilli flakes, fennel seeds and sea salt, then add the garlic, lemon zest and juice and 2 tablespoons of the olive oil and combine to a paste. Using clean hands, rub this mixture all over the pork. 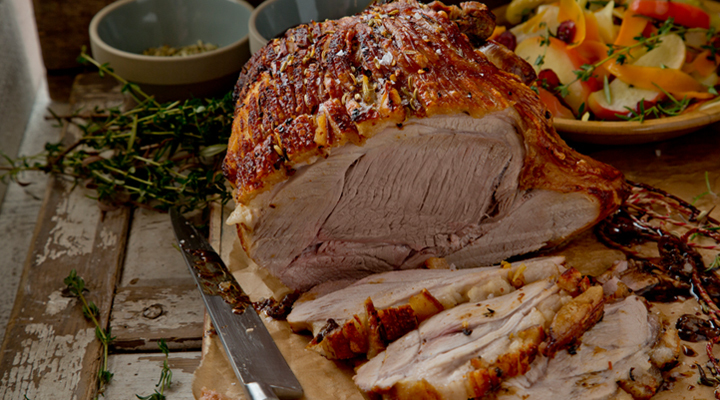 Transfer the pork to a wire rack set in a roasting tin and cook in the oven for 2 to 2½ hours. 3. Meanwhile, use a spiraliser to create long noodles out of the celeriac, parsnips and carrots and place in a large bowl. If you don’t have a spiraliser, use a vegetable peeler to make long ribbons instead. Add the apple wedges and cranberries too. Drizzle with the oil, vinegar, honey, rosemary, thyme and some salt and pepper. Toss to coat all the vegetables and place on a roasting tray. Cover and set aside until the pork is nearly roasted. 4. Once the pork is tender and falling apart when pulled, increase the oven temperature to 200°C/gas mark 6 and roast for a further 25 to 30 minutes, until the crackling is crisp. Place the tray with the vegetables and apples in the oven now too and roast for about 20 minutes. Remove the pork from the oven and check the vegetables. Shake them a little and season them well. Add a drizzle of cider vinegar if needed and keep warm. 5. Carve the pork and serve with the roasted vegetables and some cranberry sauce, if using.